For this post I will list some things I think are important to know when using the cable cast-on for top down knit socks. I like this cast-on since it is stretchy without being too stretchy and loosing its shape. : Use the English style of knitting since it is easier to control the tension by throwing the yarn. It just takes too long using the continental style of knitting. Trust me on this. : Pull each new stitch tight when it is over both needles. This makes it easy to put the right needle tip between the stitches and keeps the stitches evenly spaced. : The row of stitches being formed are the wrong side of the fabric for in the round knitting. This means when doing a knit cable cast-on stitch a knit stitch will face you and a purl stitch will appear on back or right side of the sock. : If your knitting will be joined in the round then purl all the stitches to get a knit edge on the right or outside of the sock. : Just like in knitting the new stitch being pulled through is making the stitch being worked a knit or a purl. Since the yarn is being pulled through between the stitches the stitch being worked is the one on the right. It is not the loop that has just been pulled through the two stitches. 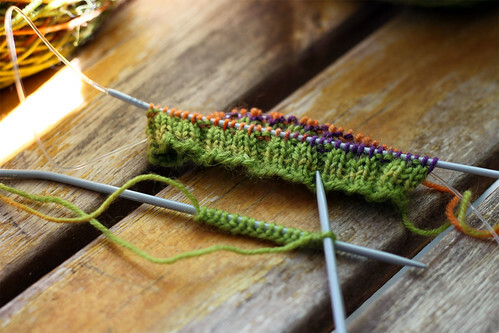 : It is possible to knit and purl stitches in a cable cast-on. I went the easy way and purled all the stitches on the sock start pictured below. The rib is an uneven one so as to match the pattern I am going to knit on the sock better. I liked the knit edge with this rib pattern. I used needles one size larger to get more stretch to the edge. This post is more for me than anyone in particular. I had trouble wrapping my thinking around to get the stitches to look like I wanted them to. Maybe it will help someone else. The long tail cast-on just seemed to constrict the edge, and larger needles made it look loopy to me. This entry was posted on Thursday, May 14th, 2009 at 3:00 am and is filed under Knitting. Tagged: Knitting. You can feed this entry. You can leave a response, or trackback from your own site. It’s a gorgeous cast on. I’m going to have to try this on socks!